The government has revised upward, import tariffs and excise duties intensely for all motor vehicles and spare parts except on agricultural tractors, buses, lorries and trucks with effect from 31st March 2012. The increase of excise duties were sharp and intense and in some cases the cumulative effects of all taxes now stand at 350% of CIF price. For an example diesel driven cars above the CC capacity 2500 and reconditioned diesel driven vans now earn 350% cumulative taxes at the point of import. The cumulative taxes and levies on popular modes of transport such as three wheelers and motor cycles have increased from 51% and 61% respectively to cumulative taxes of 100% of the CIF value. However with a view to save on imported fuel and on environmental protection, the government continued to levy relatively low excise duties and import tariffs on hybrid vehicles. The rest of the taxes and levies such as VAT, PAL, NBT, EDB Levy etc remained unchanged. In order to discourage import of reconditioned and old vehicles, the government has also revised the age of the vehicles under the import control system. Buses which come under the HS number 87.02 have been exempted. The maximum age of the passenger motor vehicle is now set less than One year old from the first registration. It would be recalled that the government has once in mid 2010 reduced both import tariffs and excise duties sharply for all the motor vehicles by almost 50% and subsequently made marginal upward revision on certain types of vehicles. The sharp reduction of duties and taxes resulted in increasing the import of motor vehicles to the country and generated high custom revenue to the government at that time. Consequent to the relaxation of import tariffs and excise duties, the total import of motor vehicles had been increased by 147% from 469,207 units in 2010 to 523,963 units in 2011. Revenue from excise duties on motor vehicles alone increased by 353.6 per cent during the 8 months ended 2011 over the corresponding period in the previous year. In spite of the reduction in excise duty rates the increased number of motor vehicles imported offsets more than the declined excise rates. The non-market driven exchange rate prevalent at that time would have also contributed as an inducement for increased motor vehicle imports to the country. Relatively low market interest rate would have also contributed in generating required credit in the banking sector and the leasing industry to cater the import financing of motor vehicles. According to the statement issued by the government, the current upward revision was effected to achieve the objective of controlling the sharp increase of import bills and thereby reducing the pressure on the widening trade deficit and the balance of trade. The reduction of import bills on petroleum products and easing the ever growing road congestion and heavy vehicular traffic were other objectives aimed at achieving through this measure. It seems that authorities have also realized that the volume of traffic has now reached a saturation point in the country. This latest fiscal and trade policy measure could be viewed in the context of a series of measures adopted by the government (upward revision of benchmark interest rate, non-intervention in the foreign exchange market by the Central Bank, upward revision of administratively controlled energy prices and imposition of limitation on credit supplied by the banking sector etc) to reduce and discourage import expenditure and to control the credit expansion and liquidity in the economy to contain the inflationary pressures. The main positive effect of this fiscal policy measure is that if the latest measure is continued without interruption for a considerable period of time, a most likely trend of drastic reduction in the import of motor vehicles could be observed to the country, resulting in an effective reduction of import bills and having certain salutatory effects on the balance of trade. The reduced imports of motor vehicles will also result in corresponding reductions of imports of petroleum, once again giving relief to the ever increasing import bills in respect of energy imports. Although the reduction of private motor vehicle imports are likely to realize, the tendency for the increase of import of commercial vehicles for public transport may likely to maintain as the demand for public transport system continues to grow at a high rate. The negative aspect entailed in this measure is that the low and middle class segment of the Sri Lankan society to own a vehicle becomes a distant and far reach reality. 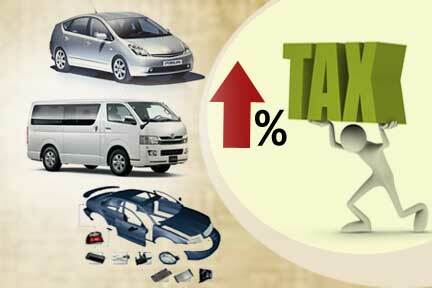 On the other hand with the reduced vehicle imports, the income generated on taxes to the government will also decline. The growing trade of motor vehicle imports, distribution and sales business will also be adversely affected. Owning a motor vehicle in the Sri Lankan society not only provides a convenient mode of transport to the owner but also perhaps more social status in the society. The higher the value and the brand of the vehicle the social status of the owner increases correspondently. Import of motor vehicles on remission/waver of duties at various proportions has now become a permanent feature of the Sri Lankan motor vehicle import regime. The privilege was originally offered only to a limited number of eligible applicants basing on restrictive criteria, on the premise to enable the eligible people to dispose of their official duties towards the nation effectively and efficiently. In the passage of time, the privilege has been extended and expanded systematically and gradually covering a large number of politicians and public officials with incremental proportions on permitted values, cylinder capacities and frequencies of privileges. As a result the government has to forgo a considerable amount of major revenue source while the recipients of the privilege earned disproportionate benefits. With the increased duties of the current measure, naturally and invariably the desire for retention and enhancement of the frequency of imports and scope of coverage for import of vehicle under privileges would increase. The measure also created extended rent benefit (the difference between the market value and the value of privileged import vehicles) due to the current duty structure. It has also been pointed out that these segments of privileged class has already been provided with official vehicles (including fuel and chauffeurs) to carry out their duties making the duty free concessions as an additional perk to their income. If the policy formulators relax and enhance the scope of privileges, due to pressure from powerful segments, the objectives of the measure will not be realized. The immediate monitory beneficiary of this measure are the importers of the motor vehicles who had custom cleared stocks in their warehouses where they can now sell those stocks under the upward revision of duties creating disproportionate profits. However, the importers will also encounter difficulties on the orders already placed with manufactures or exporters overseas which are not either cleared or on the way to Sri Lanka. With the likely decrease of demand for vehicles, importers, agents and retail sales outlets of motor vehicles will also have to endure a decrease business until trade stabilizes and recovers. The second hand value of the vehicle belonging to individual owners will also likely to increase. However the cost of maintaining a vehicle would also increase due to the increased price of spare parts as a result of high duties imposed on spare parts by this measure. The finance leasing business has been thriving in the recent past all over the country mainly due to increase business of car leasing. It is estimated that almost 50% of the leasing business is related to the vehicle leasing segment. With the reduced demand for vehicles, the leasing business would be adversely affected. However this trend may have a positive impact on limiting the credit expansion in the financial market. It is correct that Sri Lankan streets seems to have reached a saturation point and are unable to absorb more fleets of vehicles anymore despite the fact that the government has taken concrete, tangible and visible expansion of road networks through out the island via the “Maga Naguma” road development project. In a shocking disclosure, it was reported in the media that almost 600 people were killed in motor accidents during the period of January 1st to 28th March of this year. A total of 1,750 were killed due to the road accidents in 2011. Reckless, irresponsible and lawless driving habits, traffic congestions on the road contributed to this misery. Less vehicles on the road, improved road networks, better and organized public transport systems and disciplined driving habits would certainly be a welcome change required urgently in the country. One of the other important aspects of the Sri Lankan import tariff regime in respect of import of motor vehicles which is not well known in the public domain is the preferential tariffs offered by Sri Lanka for the import of certain types of motor vehicles under the Globalized System of Trade Preferences (GSTP). Preferential tariff reduction of different proportions ranging from 20% to 36% (MOP) have been offered for import of motor vehicles covers under HS heading 8703.21.61, 8703.21.71, 8703.21.79, 8703.21.91, 8703.21.92, 8703.21.93, 8703.23.51, 8703.23.52, 8703.23.53, 8703.23.59, 8703.23.61, 8703.23.62, 8703.23.63, 8703.23.69, 8703.23.71 etc. These vehicles originating from countries such as Thailand, Republic of Korea, India, Indonesia, Malaysia and Singapore who are members of the GSTP would be qualified for preferential duties. However it should be noted that the customs tariffs for motor vehicles are at relatively low level (15% and 30%) compared to exorbitant rates of excise duties. Hence the preferential customs duties may have only a marginal effect on the overall market price. Customs tariffs on spare parts have also been increased by the latest revenue protection order to charge Specific Duty or Advolarum Duty which ever is higher. However some of the selected spare parts can be imported free of customs tariffs from India and Pakistan under the ISFTA and PSFTA. Among the spare parts which can be imported free of duty are; brakes and servo-break parts, gear boxes and parts, drive-axles with differential, suspension systems, clutches, steering wheels etc. The spare parts such as rims fitted with tires, radiators, and silencers can be imported at preferential duties under the SAFTA agreement. However all imports whether preferential or not are subject to excise duties, VAT etc. There is a school of thought that abrupt revision of duties may not be the best instrument to address the balance of payment issue. In contrary to this assertion yet others argue that the import of motor vehicles constitutes a substantial portions of import bills and that the increase of duties will yield the desired results. In order to address these issues effectively it is proposed to strengthen and organize the public transport system, further improve and expand the road network, strengthen the railway network of the country, adopt better traffic management systems and implement transparent and stringent drivers testing and driving license processing systems. Above all the most important policy measure is to develop and design a national transport policy in consultation with all stakeholders for implementation on priority basis.